Easter Sunday is a Christian celebration of the Resurrection of Jesus Christ on the third day after his crucifixion at Calvary, as described in the New Testament. Easter is the culmination of the Passion of Christ, preceded by Lent, a forty-day period of fasting, prayer and penance. The last week of Lent is called Holy Week, and it contains the days of the Easter Triduum, including Holy Thursday – commemorating the institution of the Holy Eucharist; Good Friday – the passion and crucifixion of Jesus Christ; and Holy Saturday – commemorating the day that Jesus laid in the tomb. A fifty-day period called Eastertide or the Easter Season, ending with Pentecost Sunday, follows Easter. Easter is a moveable Feast, meaning it is not fixed in relation to the civil calendar. The First Council of Nicaea in 325 established the date of Easter as the “first Sunday after the Full Moon, (the Paschal Full Moon) following the March Equinox”. Ecclesiastically, the equinox is recognized on March 21, even though the equinox occurs astronomically speaking on March 20, most years. The calculation is then given for the first FULL moon after the equinox, and then the next Sunday would be Easter! This varies from March 22nd, to April 25th. The New Testament teaches that the Resurrection of Jesus, which Easter celebrates, is a foundation of the Christian faith. The resurrection established Jesus as the powerful Son of God and is cited as proof that God will judge the world in righteousness. 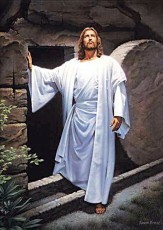 God has given Christians, “A New Birth into a living hope through the resurrection of Jesus Christ from the dead”. Christians through faith in the working of God are spiritually resurrected with Jesus so that they may walk in a new way of life. As Christians, we are an “Easter People”, placing our hope in the Resurrected Christ.